Solution: Cyclopropane is an interesting hydrocarbon. 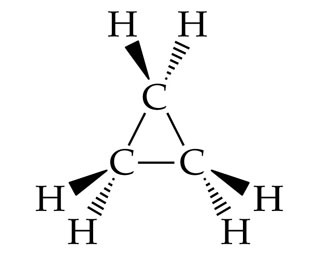 Instead of having three carbons in a row, the three carbons form a ring, as shown in this perspective drawing (see the figure for a prior example of this kind of drawing): Cyclopropane was at one time used as an anesthetic, but its use was discontinued, in part because it is highly inflammable. What is the empirical formula of cyclopropane? Cyclopropane was at one time used as an anesthetic, but its use was discontinued, in part because it is highly inflammable. What is the empirical formula of cyclopropane?